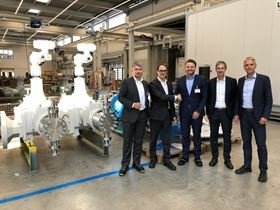 Left to right: Robert Kurz (Director Sales & Marketing, Netzsch Pumpen und Systeme GmbH), Florian Kieninger (VP Corporate Development, Lewa GmbH), Kai Stegemann (Managing Director, Star Pump Alliance GmbH), Dr Mathias Hotz (Head of Legal & Export Control, Lewa GmbH) and Stefan Glasmeyer (CSO, Lewa GmbH). Process diaphragm pump specialist Lewa GmbH is now a member of the Star Pump Alliance, the information platform for professional pump users. Founded by companies from the pump industry, the Star Pump Alliance (SPA) website www.starpumpalliance.com makes it easier for users to search for the right pump solution by explaining technologies and their suitability for various applications, then quickly guiding the user to the right supplier. The platform guarantees that any concrete inquiries from potential customers will receive a response within 48 hours of submission. SPA’s goals include offering users around the world a broad spectrum of pump technologies and making the pump search considerably easier, while strengthening the positions of technologically innovative, independent, medium-sized pump manufacturers. “We are hoping that our membership allows us to better tap into new markets and be discovered by potential customers who don’t know about our brand or portfolio,” said Florian Kieninger, vice president of corporate development at Lewa. “The SPA can support our regional sales networks. It can also make it easier for potential customers and prospects to access the network and even help to establish new contacts,” added Kieninger. Economist Tsunehisa Suita is appointed CEO of the German pump and system manufacturer Lewa Group. Japanese life sciences company YMC Co Ltd enters into a formal agreement to acquire Lewa-Nikkiso America Inc’s pharmaceutical systems business. Ebara invests ¥100 million in Japanese AI (Artificial Intelligence) consultancy and developer.